"It's All About The Show"
A big thank you for all who helped us launch the stage at #TheNewArtist and all who came to celebrate Sunday, July 29. Our hearts are filled with gratitude and return love to one and all. In the meantime, the transformation continues - and all help is appreciated as phase 2 (electric - plumbing - bathroom) begins! Thanks for being with us on the journey! Be part of the New Artist! Let Jenny's Sweets provide the treats for your next family gathering, special event - or just because! 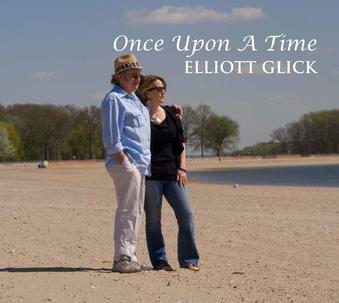 Elliott Glick celebrates the release of his CD, "Once Upon A Time," with a release party and performance on Saturday, May 21, beginning at 8:30 p.m. With him, on lead guitar, John Guth - the "maestro," as Glick describes him, who produced / recorded / mastered and mixed the CD. Click on the CD's cover above to make reservations! Writes Elliott Glick: "This CD is a collection of love songs. It turns out that I am very lucky in love, so I dedicate this to my Monica, who inspired the whole thing. I've also experienced the love of many people who helped me complete this project. They include Starving Artist music-artists Jon Burr, Jonathan Russell, and Theresa Sareo, as well as new friend Vickie Russell. Thanks to Anna Foster for her beautiful Orchard Beach photographs - and for spending a Friday morning with us on the beach. Last, but not least, I thank the 'maestro' John Guth for his wizardry - and 'Uncle' Bill Yehle and Hannah for 'all those Tuesdays.'" Elliott Glick has been a musician / guitar-player for more than 45 years. 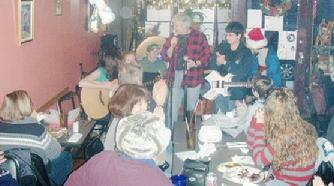 He has been teaching guitar and general music theory to all ages for the majority of those years. Glick has taught many young people; they have even been showcased at student recitals at his Starving Artist (The Artist). If you are interested in guitar lessons with Elliott Glick, please email him, or call 718.885.3779. A "Guitar Student Show" at Starving Artist; click on image to email for more information on guitar lessons with Elliott Glick - $25 / half hour. To be on our e-mail list - and receive weekly notices on the music / art events for the coming weekend - please email us and make that request! We'll be happy to add you to our email list!